2 Place the pumpkin, sweet potatoes and garlic in a oven tray. Drizzle with olive oil and roast in oven for 30-40 minutes until nicely coloured and soft. Transfer to a large mixing bowl. 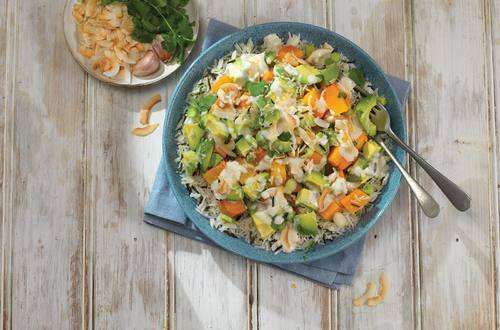 3 Mix the Hellmann’s Coconut & Lime Dressing with the coconut flakes and pour the mixture over the hot vegetables. Leave to cool. 4 Add the rice, spring onions, avocado and coriander and mix through.